Jeff Sullivan: Been a busy week! Going to be a busy week! aw: Hey Jeff, what are your thoughts on DRC+? Ross: Saw something about the Rays being interested in Charlie Morton. That… actually makes a lot of sense, right? pelkey: there’s basically no chance david peralta doesn’t get traded right? what would reasonable compensation for him look like? AJ: Does Trevor Bauer to TB for Brandon Lowe, Jesus Sanchez, and Michael Perez make sense for both sides? Rays get a stud to pair with Snell at the top of the rotation and clear some 40-man space, Lowe can help the Indians in the OF this year and move to 2B when Kipnis leaves, Sanchez gives them an OF for the future, and Perez is a cheap, young, defensively sound catcher to platoon with Roberto Perez. AJ Preller: I’ma neeeeeeed some new starting pitching if I want to take some steps forward this year. Do I trade or go for the remaining FA? Or both? Larry: Seattle and Arizona are doing a partial teardown for a quick return to contention. Care to guess which will be first to reach 90 wins again? Tim: Andrew McCutchen makes a lot of sense for the Astros, right? Did the Yankees re-signing Gardner close the door on him staying there? Ralph Lauren: Which team has the best uniforms? squeeze bunt: What do you consider as your baseball “specialty”? Kiley and Eric are obviously prospect guys, but is there a profile page somewhere on fangraphs that lays out what each writer is mainly interested/has expertise in? Jeff Sullivan: There is not! Tiger: As a Reds fan, we hear they are finally going to “spend” their money. They have been rumored to be in on quite a few guys as it is. Currently remaining, they are in contact with the Indians, and are in on Pollock. I would be thrilled with a AJP and Kluber/Bauer return but have a feeling it’s going to be something way less exciting like Keuchel and Ervin Santana. Thoughts? Ray Liotta as Shoeless Joe: Are you surprised the Twins signed Jonathan Schoop rather than coming to terms with Brian Dozier? Or is the four year age difference and a changing front office enough to move past being the most sentimental franchise in the bigs? John: At what point do we go from referring to 2018 as “this season” to “last season,” and from referring to 2019 as “next season” to “this season”? Operation Shutdown: Is Max Scherzer’s contract the best big-money pitcher contract ever? Do you see any recent SP signings living up to their deals as well as Scherzer did? Jake: What do you think attendance is going to look like at Safeco next year? Outta my way, Gyorkass: Let’s say Kyler Murray decides to enter the NFL draft after the conclusion of a great senior season at QB for Oklahoma, and gets picked pretty high in the first round (probably guaranteeing him more $$$ than his #9 pick signing bonus would) Would he have to forfeit his signing bonus with the A’s if he decides to play football? Is there a way he could plausibly make the “2 sport star” thing work? TFS: Which top player(s) do you think will get traded at the winter meetings? Bill G: Hi Jeff. Thanks as always for doing these chats. I agree that the primary issue in baseball is strikeouts. 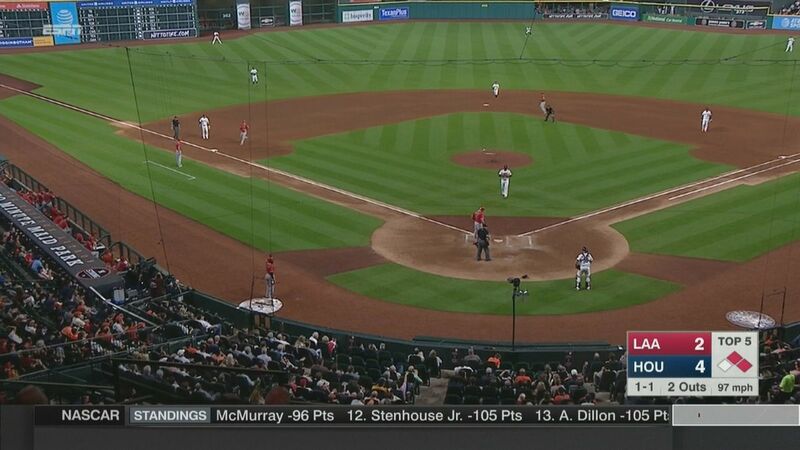 I am OK with the shift of players in the infield, however I do not like the second baseman playing short right field. A line drive over the infield is not penalized for a RHB, but the LHB is penalized by the line drive. What is your opinion? Thanks. Dave: What teams do you think are pressing the hardest for Bauer/Kluber? Ray Liotta as Shoeless Joe: Let’s pretend the Rays move to Portland. How do you think divisions are restructured? Sorry…Travis isn’t here to ask anymore. Poised: There’s a lot of similarities between last offseason’s Christian Yellich and this offseason’s Mitch Haniger. Both corner OF, same age, 3+ years of control, coming off a 4.6 win season, both career 130 wRC+ hitters. Would a Mitch Haniger trade look similar to what the Yellich trade looked like? Yellich had more history of success, while Haniger has an additional year of control. Giganthony: Volcano or Dante’s Peak? Outta my way, Gyorkass: Some talk has emerged of CIN coming onto the contending scene this year – where is the room for that in 2019? Every division rival is decent to excellent…just wondering where the wins are going to come from. Big time regression from several NLC teams? Larry the Cable: Who would you want for the next 2 years from 2 players who seemed to have a similar breakout last year and play the same position: Muncy or Aguilar? Both hit 35 bombs, Muncy had 100 less AB but his ratios were way better. Both are 28. Interesting comparison. JPK: Which of the top free agents are most likely to sign at the Winter Meetings? Jeff Sullivan: Does JA Happ count as a top free agent? Rays Fans: What is the kind of signing or trade that the Rays could make to put them in the position to steal the division? We’re thinking an under-the-radar reliever. Jeff Sullivan: Hear me out here. This could be stupid but there’s an opportunity! Tyler: If they remove the shift from baseball, what incentive would there be to not sell out even more for power? knowing that if you roll over it there is an even greater chance that it can get through a hole now. With velo where it is, getting rid of the shift is not going to change how hitters approach an at bat. greg: Joey Votto began his 10yr $225M extension in the ’14 season and has accumulated 23.3 WAR since then. He’s got to be pretty close to earning every bit of that, right? Outta my way, Gyorkass: Trading for Goldy is probably one of the few ways STL had to improve their roster, but supposing they went with the “peak offense” lineup (Carp @ 3rd, JMart in the OF, etc) that’s going to lead to some hilariously bad defensive arrangements, yeah? Sir Nerdlington: I strongly dislike the imbalanced schedule. That is all. Anthony: Why is MLB now concerned about attendance, after pushing for smaller ballparks in downtown locations? Dave: Schwarber & Happ for Kluber, who says no? TKDC: Let’s say there was a rule that said that if Mike Trout is playing, you have to play with 8 players. So your lineup is 8 players and you play 8 guys in the field. If you replace him during the game, you get 2 guys. Would Trout still be valuable to a team? Jeff Sullivan: Does that mean the lineup includes an automatic out, or is it just shorter? Syndergaardians of the Galaxy : Is there any way that I can look up the total WAR produced by the players drafted and signed by a particular team over a particular time span? Ray Liotta as Shoeless Joe: Troy Tulowitzki said, “I’m a shortstop…if someone is better than me, I’ll pack my bags and go home.” Is there a better dream scenario for Ross Atkins?! Ozzie Ozzie Albies Free: Since high velo is usually the culprit in arm injuries for pitchers, has there been any research on how fast kids are throwing these days? Is there a little leaguer throwing 80 already? What’s an ideal velo for 12, 13 year olds to throw? Gob: Is Brock Holt following the Daniel Murphy/Justin Turner career path? Hamboy: Please tell me I’m stupid but would Kyle Seager, $10MM and a lower level prospect to STL for Dexter Fowler (and his contract) and Ryan Helsley be a reasonable trade? “Who says no”, as the kids say. Jeff Sullivan: Do you move Carpenter to second and replace Wong? Nick: Hi Jeff! The main article on the ESPN MLB page this morning is “Kluber for Schwarber” and argues that Kluber for Schwarber+Happ is a trade in which Cleveland would come out ahead, citing things like Schwarber is “at the very least” a 3-win player now. My Cleveland homer-ism aside, that’s a ridiculous proposal for a player with Kluber’s surplus value, right? Outta my way, Gyorkass: Does Carlos Martinez re-emerge as a member of STL’s starting rotation, or is he strictly a ‘pen arm moving forward? Outta my way, Gyorkass: What are your general expectations for Jimmy Nelson this year? Jeff Sullivan: Let it not be forgotten that, if Nelson is healthy, the Brewers have an ace! Brodie’s wild ride: If the Mets do trade for Kluber or Bauer, what do you think a package would look like? What about other teams that have been connected to the starters like the Reds? Nicky: Have MLB players outgrown the baseball field? They are throwing the ball harder than ever, hitting the ball harder than ever, and there’s no reason to think their (league average) athleticism will ever decline. We might have to readjust the size of baseball field for those players. Crazy idea? AJ Preller: Now that Syndergaard’s off the table, how can I use my outfielders to get Bauer? Kristen: How amenable would DET be to throwing in prospects if my Rangers offered to take Zimmerman off their hands? Larry the Cable: Did the NL East just become the most exciting Division to watch, if they weren’t already? Every team seems to be trending for an over .500 season rather easily and continuing to make more moves to improve. DBRuns: Does Bryce Harper get $300+ million? The Corbin deal seemingly takes the Nats out of the sweepstakes. The Yankees already have one $300 million contract on their books. I don’t see the Dodgers handing that kind of money to a guy who only exceeded 1.5 bWAR twice in the last five years. I think Harper falls way short of that threshold. Agree? Bearry: Yandy Diaz, Encarnacion, and Bauer to the Rays makes a ton of sense… Fills two all-star sized holes, has years of control baked in, and offers some real upside in Yandy. Sign me up. We hoped you liked reading Jeff Sullivan FanGraphs Chat — 12/7/18 by Jeff Sullivan! Man, I hate Fridays. I always make a point to try to catch Jeff’s chat, and work almost always seems to prevent me from a little enjoyment. So, the obvious solution is for Jeff to start conducting chats twice or more a week.